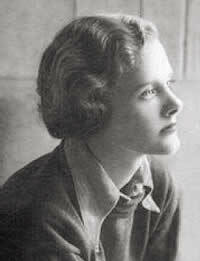 Daphne du Maurier’s first novel, The Loving Spirit, was published in 1931 and her last, Rule Britannia, in 1972. She was at the peak of her fame during the 1950’s, being described, when My Cousin Rachel was published, as ‘the highest paid woman writer in Britain’. There are few other women writers of that era who remain as popular today as Daphne du Maurier. She was a great story teller but there is a special something about her writing that means it remains fresh and relevant today. There has been an interest in Daphne from the beginning of her writing career and this only seems to increase with the passage of time. On these pages we plan to surprise you with facts that you might not already know about Daphne du Maurier and her writing, and about members of her family and people associated with her. If you have an interesting fact please let us know so that we can include it here and share all the information we can with those who are interested. Maureen Baker-Munton (1922–2013) - a short essay inspired by the sale of her archive of Daphne du Maurier related material.